It’s a yearly tradition now, where I go on about how the best part about being a moderator in Stack Exchange network of sites is when you get to donate to any charity of your choice from the short list. Nothing has changed. Despite the many awesome things that I get to witness in the community, the one thing that gives me utmost happiness is when I click the ‘Submit’ button to the “Giving Back” Charity form after making my selection. The pleasure, I feel, is more with the person who is giving rather than with the person who is receiving. And so, this year, I have chosen to donate my share of $100 to Doctors Without Borders (MSF – Médecins Sans Frontières) and feel quite good about doing so. Thank you Stack Exchange for giving me this opportunity. Read more about Stack Exchange giving back 2016. People were out of their houses. They were on the streets. They were waiting. Waiting like restless kids wait for their school bells to ring so they can scoot home. Waiting like it was the first time their houses were being powered up. And finally, the power was restored. A collective sigh of relief could be visibly felt and the people dropped their time-filling empty conversations with their neighbours and quickly returned to their honeycombs, with puzzling purpose. And I connected to the Internet right away, unable to wait any longer. Just like that, the struggles of the past three and a half days were forgotten and I was ready to live in the present, ready to live the now. Now, which was how it used to be. Cyclone on the cards. It was raining, cool and windy. The perfect weather for sleeping and sleeping I did plenty. Just enough to pass the first day. What to do on the second? Or the third? It was hard passing minutes for power-slaved people like me, who thrive on power for everything. Everything. Running out of water and running out for water. Fridge becomes a glorified cupboard. Day ends when the sun sets. Daylight saving needs no reminding. People were out of their houses. They were on the streets. In the queues for some water and hoping things will be back to how it used to be. We were back to how it used to be. Ask Ubuntu moderator election is now underway! We are in the midst of our 5th moderator election to add more firepower to our existing mod crew. In the 6 years that Ask Ubuntu has been around, nearly 230,000 questions and 300,000 answers have been posted on the site, with the daily traffic clocking a whopping 487k visits as of now. These numbers will only go up from here and to support this growing community, we are expanding our moderator team to accommodate two more. As is the policy with Stack Exchange network of sites, the new moderators will be added to the existing team and not replace them. If you have a minimum of 300 reputation on Ask Ubuntu and think you can do a good job, consider nominating yourself for the role. The nomination phase itself runs for 7 days, followed by a week of primaries and then the actual election. People with 150 reputation are eligible for voting and I encourage them to vote for candidates that they think are most suitable for the role. If you have any questions about the election process, you can ask them on meta. Discussions about the election can be had in the chat room too. If mod work is not your cup of tea but you’re still looking for a way to help, you can always help us answer the incoming new questions. Featured questions would be a good place to start. Author jokerdinoPosted on June 7, 2016 June 29, 2016 Categories Planet Ubuntu, UbuntuTags Ask Ubuntu, election, moderatorship, Stack Exchange, UbuntuLeave a comment on Ask Ubuntu moderator election is now underway! It’s always an honour and a privilege to be a moderator in a Stack Exchange site. Every December, the company offers to make a $100 donation to a charity of our choice on the behalf of us moderators. It’s a touching gesture and one that I am proud to be a part of. Some of you may remember my donation to Wikimedia foundation back in 2013 and I regret to admit that I missed the donation offer email in 2014 amid my inbox flooding. But no such thing shall happen again and I remembered to stay on top of my inbox this time around. I made up my mind to choose Doctors Without Borders because of their selfless act of service, who don’t mind putting themselves in risky zones just to do what they love doing the most — helping people, regardless of their political stance. Such compassionate people have to be encouraged and I will use this opportunity to do exactly that. So, thank you selfless doctors of Médecins Sans Frontières for your contributions to the humanity and thank you Stack Exchange for making me feel good about myself. Read more about Stack Exchange giving back this year. Do you connect with your future self? Have you ever postponed your work to another day even when you are aware you are the one who is going to do it anyway? If you answered yes, it’s probably because you don’t consider your future self as yourself. Let’s dwell into a little psychology for the matter. Hershfield HE’s research suggests that a lot of people tend to put their present selves ahead of future selves when making decisions that could affect their future significantly. This is the case for behavioural, financial and health decisions and many others too. People often treat the future self as if it is in fact another person. On a general level, individuals make attributions about the future self in the same manner that they do for others, for example, by attributing the future self’s behavior to dispositional factors rather than situational ones, and to make decisions for the future self using a similar process that they use to make decisions for other individual. The truth is that we are bad at predicting what effect our current actions — be it good or bad — will have on our future and blindly go through it in an impulse. That would explain many financial ruins (mainly retirees), heat-of-the-moment scuffles and passionate crimes. If we spent a few seconds thinking about what that course of action will lead us into, maybe we won’t put ourselves in that situation. I guess that’s why we have the saying Look before you leap, to serve us a warning. So, next time you think of postponing your work, assume you are assigning the work to a different person and imagine what their response would be when they are shoved more work without a valid reason. Most likely, an actual different person will not like what you are doing and why should your future self like it any better? Author jokerdinoPosted on November 5, 2014 November 6, 2014 Categories OpinionTags decision-making, future, nablopomo, psychologyLeave a comment on Do you connect with your future self? 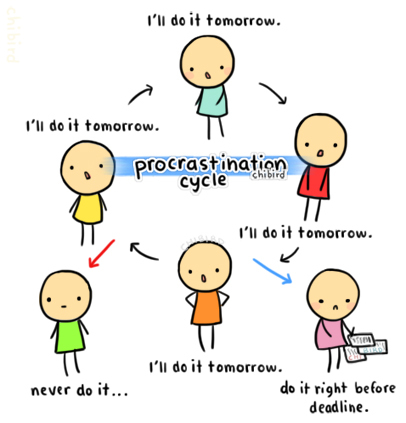 Procrastination is one big game killer for me. Slacker, procrastinator, lazy are some of the words that are used to describe me. I won’t deny that they are pretty accurate descriptions of me. I always had a huge inertia towards work — can’t quickly get into a mind frame for doing work. Instead of doing school work, I spend time surfing through Internet, trawling around in social network sites, playing online games, contributing to open source communities and many other time wasting schemes. It’s called persistent starting. Pick something you want to do but keep putting off. It can be anything. Tell yourself you’ll spend five minutes doing it and then quit after five minutes if you still don’t want to do it. After five minutes if you still want to quit then quit. No tricks or mind games. You won’t want to quit. What happens is the part of our brain that plans and carries out our day to day actions takes over our bodies and we just keep doing what we’re doing. Planning the next step, executing the current one. Autopilot in a way. This motivation tip, persistent starting, was part of the book The Now Habit by Neil Fiore. I’m yet to read the book but am confident it will be worthwhile. Hope you find this little tip useful for boosting your productivity. Interesting is a colourless word. If I say something was interesting, it probably means I have nothing to really talk about it. It could mean I was barely impressed. It has joined the laundry list of words that give absolutely nothing away to the listeners. And yet, it’s been used all over the place, from describing a person and their character to commenting on a new film and what not. Frankly speaking, you can spot the word in places where one voices their opinions. For what its worth, “interesting” could very well be a synonym for boring. It has been misused and overused to the point that the word has lost all of its true meaning. These days, it has been limited to just a filler word, the word you use to cover up the awkward pause as you try to think of something interesting to say to others. Calvin calls it ‘interesting times’ but he doesn’t really mean it. Now, if only we had accurate words to exactly express what we feel. Oh wait. It’s overused because it’s become a go-to filler word when we become too lazy to use something more precise. It’s misused because we often hide behind it instead of saying what we truly think and feel. And that’s simply the truth. There are enough alternatives that can do a better job than what ‘interesting’ is doing. So maybe we should vow to stop using ‘interesting’ as much as possible and use words that are more revealing (not in a risque manner, mind you). That should be one neat trick for improving your vocabulary too! The broken spectrum Create a free website or blog at WordPress.com.